Cedar cladding is characteristically silky in texture and the wood has a strong aromatic odour which is most pungent when freshly cut. 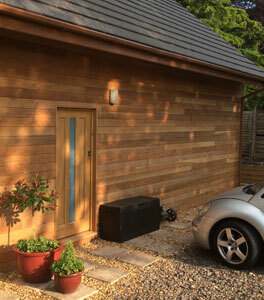 One of the lightest commercially available timbers, western red cedar has, for many years, been the most popular choice for timber cladding in the UK. It’s popularity is due to its stability and extreme resistance to decay. This durability means that, left untreated, the cladding boards will last for many decades. However, if a surface treatment is required, the stability and complete lack of resin within the wood make cedar the ideal choice for painting and staining. The specie Western Red Cedar (Thuja plicata) grows widely across Northwest America and Canada, but also grows here in the UK. Both variations of cedar are used for cladding buildings, although their appearance is quite different. Canadian cedar tends to be relatively free of knots and dark brown to pink in colour. 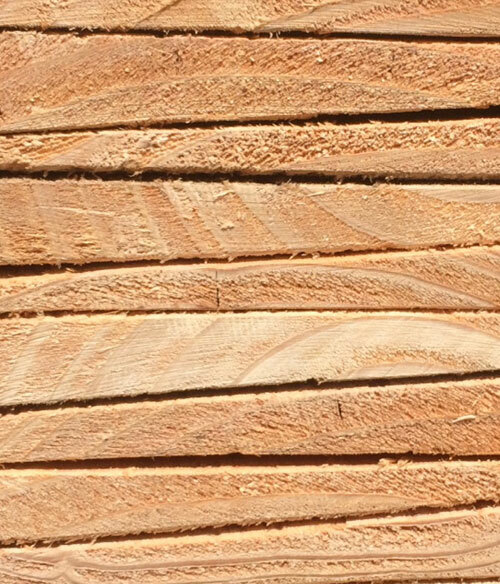 British cedar is paler in colour, although more consistent, and contains many knots. Vastern Timber is a supplier of both the Canadian and British versions, holding large stocks of both. We ensure that regardless of where our cedar comes from, it is all derived from well-managed and where possible independently certified woodlands. What’s the difference between British and Canadian cedar cladding? Unsure about which type of cedar to use? Watch this video to see Tom explain the difference between British and Canadian cedar cladding. Cedar cladding is the most popular choice for exterior cladding because of its excellent durability, stability and volume to weight ratio. It is the most stable of all softwoods, with a very low tendency to shrink, warp, twist or check. The low density of cedar has many benefits. The wood is very light, which makes it easy to move and install while the open cell structure gives the wood excellent thermal and acoustic properties. However, western red cedar is a relatively soft and brittle wood, which can easily be damaged if knocked or scraped. When using cedar cladding you should be aware that the natural oils in western red cedar will react with any ferrous (iron based) compounds. 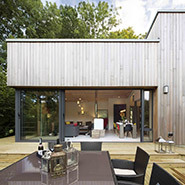 Consequently, cedar cladding in areas with high pollution levels may weather to a black rather than a silver colour. As with all reactive timber species, care should be taken to use stainless steel fixings to avoid corrosion and associated blue staining. 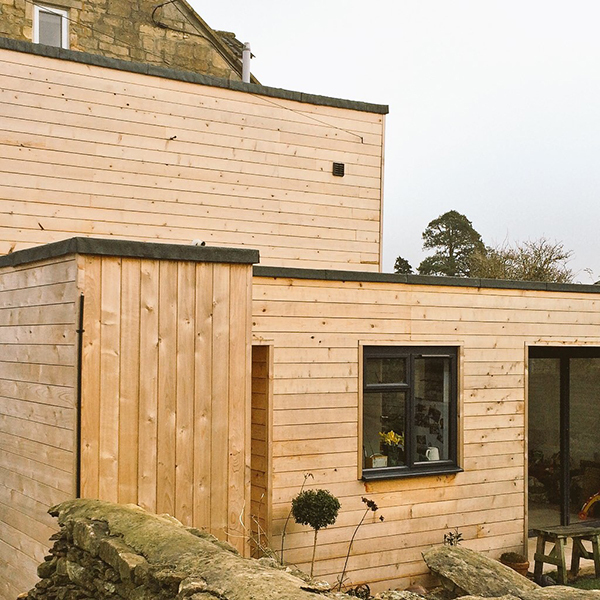 We offer our cedar cladding in a range of dimensions and profiles to suit a wide array of projects. Sawn cedar cladding profiles such as feather-edge create a rustic appearance suited to barn conversions and rural properties. Machined cedar profiles such as halflap, shiplap and tongue and groove create a more precise aesthetic suited to contemporary designs. Feather-edge cedar cladding boards are available in widths up to 200mm for British cedar and 150mm for Canadian cedar. 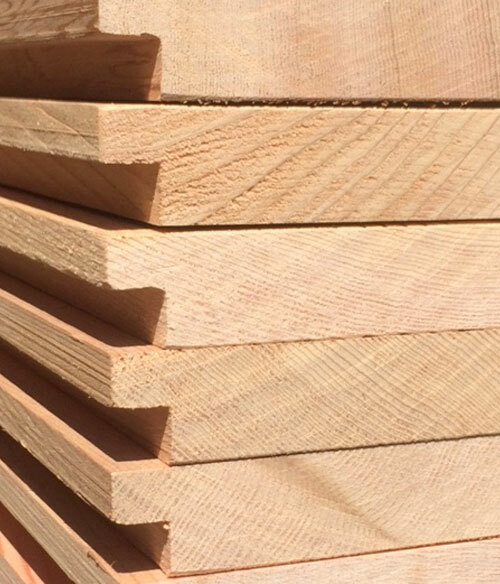 For machined cedar profiles the most popular finished dimension is 20 x 145mm, although other widths are available. For an interesting design you could consider mixing more than one width of board. 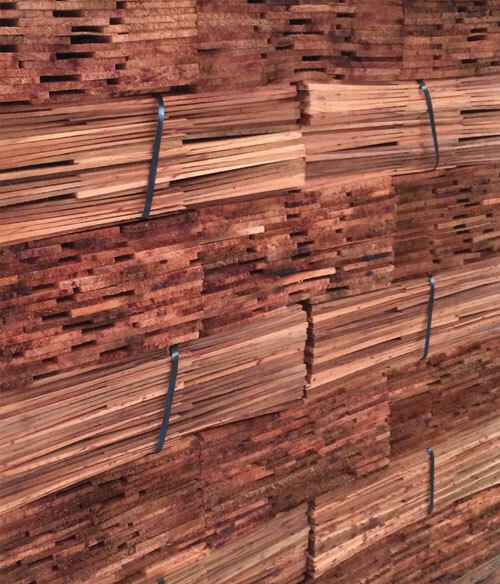 We also offer sawn cedar shingles that are suitable for both wall cladding and traditional cedar shingle roofs. Shingles are only available from Canadian cedar. Cedar is one of the most stable and lightweight timbers making it relatively easy to fit. However as with all cladding it is important that you follow some basic rules. Take some time to browse through the advice section. If in doubt give us a ring and we will do our best to answer your questions. Most importantly, it is essential that you only use stainless steel nails or screws to fix your cedar cladding boards to avoid staining and corrosion. We can supply the correct fixings with your cladding. Canadian cedar prices have been rising throughout the last two years but this trend seems to have stabilised. We hope to hold current prices for 2019. * Subject to profile and dimension. May be changed without prior warning. Discounts available for large areas.